Also included is a demonstration of both manual and machine techniques for cold finishing, using equipment such as a diamond disk grinder, hand grinder, rociprolap, vibrating lap, tile saw, and wet belt sander. 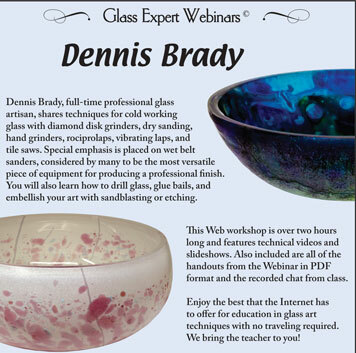 You will also learn how to drill through glass, and how to improve a finish with sandblasting or etching. Whether your goal is to learn how to reshape glass, create a stunning finish, or bring it to a fine polish, this webinar DVD will teach you how!